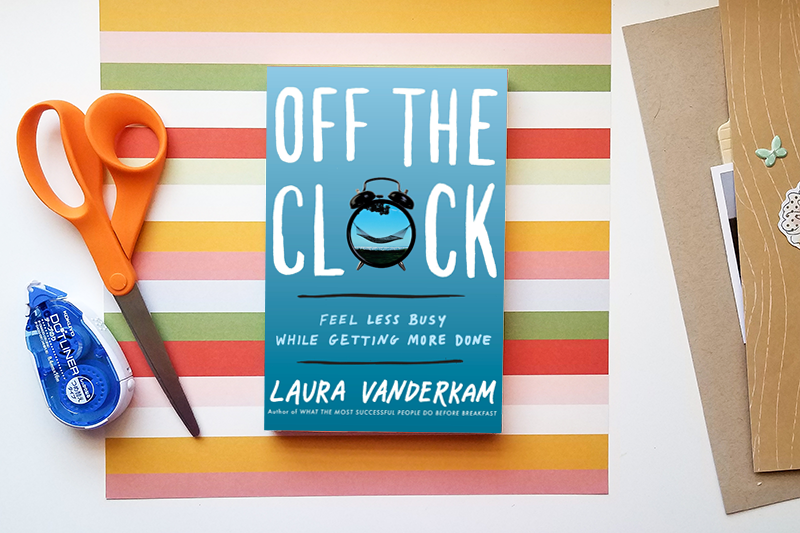 This month the Simple Scrapper Book Club is reading Off the Clock by Laura Vanderkam. Never have enough time? Learn secrets of reducing overwhelm and getting more done when you’re just so busy. Download this month’s discussion guide. New to the Book Club? Each month we read a non-fiction selection and have a conversation connecting the ideas to scrapbooking. Discussion guides are free for all and posted on the 1st of each month. Monthly chats take place in our member community, generally on the last Thursday of the month. If you enjoy books about self-improvement, creativity, happiness, and storytelling, this is the club for you. Because the chosen books are non-fiction, there are no spoilers. That means you are welcomed and encouraged to participate whether or not you finished (or even started) the book. The intent is to share ideas at the intersection of intentional living and scrapbooking. What can we take away that would add more joy or ease to memory keeping?